A verandah that’s one of a kind! Every now and again we get asked to do a project that’s very different to anything we’ve done before and such was the case when clients from the western suburbs of Melbourne contacted Jaan McKenzie to build a verandah for their home. 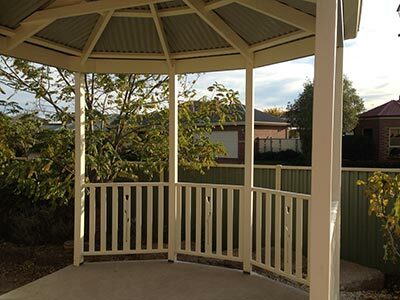 After sitting down with the clients to discuss the verandah and organise a free quote, Jaan soon discovered the clients wanted an outside living area with a difference. 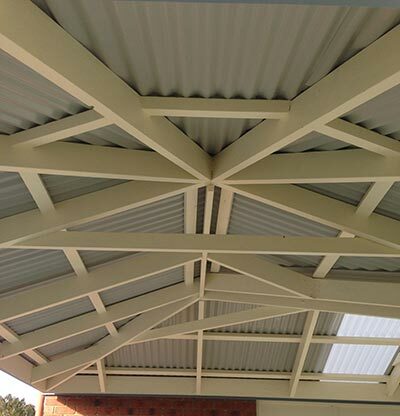 An L-shaped verandah that would feature a gable roof in one section and a hexagonal roof in the other. Not one to be put off by a challenge, Jan set about to create the one-off verandah, using specialist skills and knowledge he’s built up over many years working in the industry. 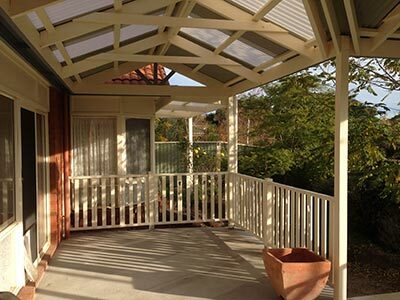 The final result is part gazebo, part verandah and a totally stunning one-off outside living area! The tricky part for Jaan was getting the timber roof framing spot on, to create the shapes of the gable and hexagonal roofs. After that, the timber was covered with Colorbond metal roofing and polycarbonate roofing to create an outside area that’s not just exquisite but also very practical. It’s a project that’s well loved by the client and is also a favourite of Jaan’s! Life’s too short to compromise. Phone Outside Concepts on 1800 601 674 for a free quote.